In Ukraine, the OUN-UIA (organization banned in Russia) members will receive the same state guarantees as the Red Army soldiers who fought against the fascists. Ukrainian leader Pyotr Poroshenko signed the relevant amendments to the law on the “status of war veterans, and their social protection guarantees” on December 23, the Verkhovnaya Rada of Ukraine website reports. According to the law, the list of veterans now includes members of various Ukrainian nationalist organizations, most of which Russia considers to be terrorist organizations. The Verkhovnaya Rada supported the above amendments on December 6. On December 9 in Lvov, Poroshenko promised to sign the amendments immediately. It is worth mentioning that during the Great Patriotic War (WWII), UIA and OUN (organizations banned in Russia) unleashed a wave of terror against their own citizens. 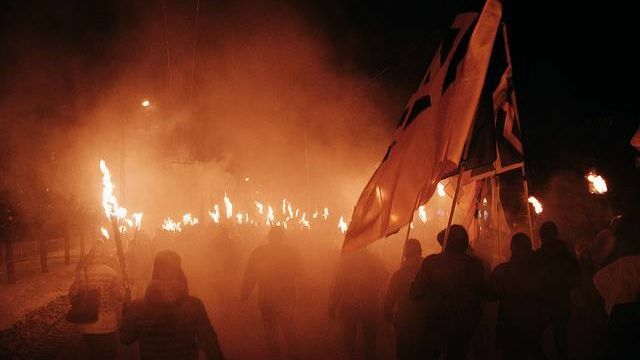 The Ukrainian government has been consistently engaged in the persistent glorification of Ukrainian nationalists since the coup in 2014. For example, the usual Soviet military greeting was replaced in Ukraine with the words “Glory to Ukraine” [a copy from German Nazis’ “Heil Hitler – Sieg Heil” – translator’s note] in 2018. This entry was posted in News from Ukraine and tagged Bandera Nazism, Ukraine, War Against History. Bookmark the permalink.